Senior patient who are denture wearers consider the following from a recent study by the American Associations For Dental Research! “Poor oral health and hygiene are increasingly recognized as major risk factors for pneumonia among the elderly”. This study looked at the oral health behaviors and incidences of pneumonia in the community-living of elders 85 years of age or older. The study concluded that both perceived swallowing difficulties and overnight denture wearing were independently associated with approximately 2.3-fold higher risk of the incidence of pneumonia, which was comparable with the high risk attributable to cognitive impairment, history of stroke and respiratory disease. In addition, those who wore dentures while sleeping were more likely to have tongue and denture plaque, gum inflammation, positive culture for Candida albicans, and higher levels of circulating interleukin-6 as compared to their counterparts. This study provides empirical evidence that denture wearing during sleep is associated not only with oral inflammatory and microbial burden but also with incident pneumonia, suggesting potential implications of oral hygiene programs for pneumonia prevention in the community. 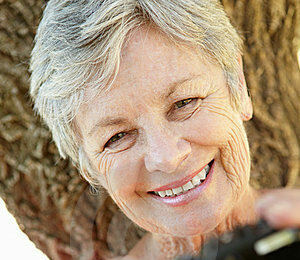 The study concluded that denture wearing during the night should be discouraged in geriatric patients. Larrondo Dentistry is dedicated to providing the best oral care to all patients regardless of their ages. Feel free to contact Dr. Jorge E. Larrondo concerning any question you may have regarding your oral health.